Google Cloud Platform introduced several additions to its enterprise networking portfolio. 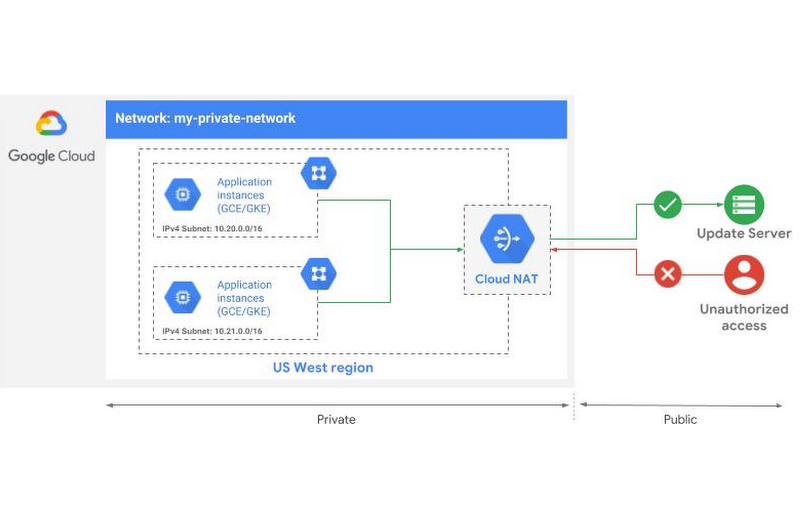 Cloud NATBeta - a Google-managed Network Address Translation service that lets enterprises provision application instances without public IP addresses while also allowing them to access the Tnternet for updates, patching, config management in a controlled and efficient manner. 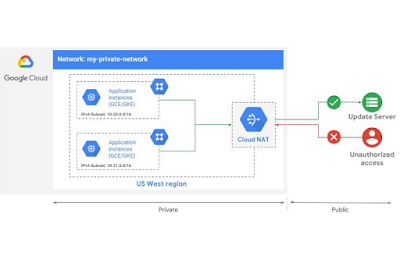 Outside resources cannot directly access any of the private instances behind the Cloud NAT gateway, thereby helping to keep your Google Cloud VPCs isolated and secure. Firewall Rules LoggingBeta - allows enterprises to audit, verify, and analyze the effects of firewall rules. For example, it provides visibility into potential connection attempts that are blocked by a given firewall rule. Logging is also useful to determine that there weren't any unauthorized connections allowed into an application. Firewall log records of allowed or denied connections are reported every five seconds, and can be exported to Stackdriver Logging, Cloud Pub/Sub, or BigQuery. Managed TLS Certificates for HTTPS load balancersBeta - load balancing customers can now deploy HTTPS load balancers, Google taking care of provisioning root-trusted TLS certificates for you and manage their lifecycle including renewals and revocation. Google Cloud Platform (GCP) introduced more data storage replication options within regions and between regions. 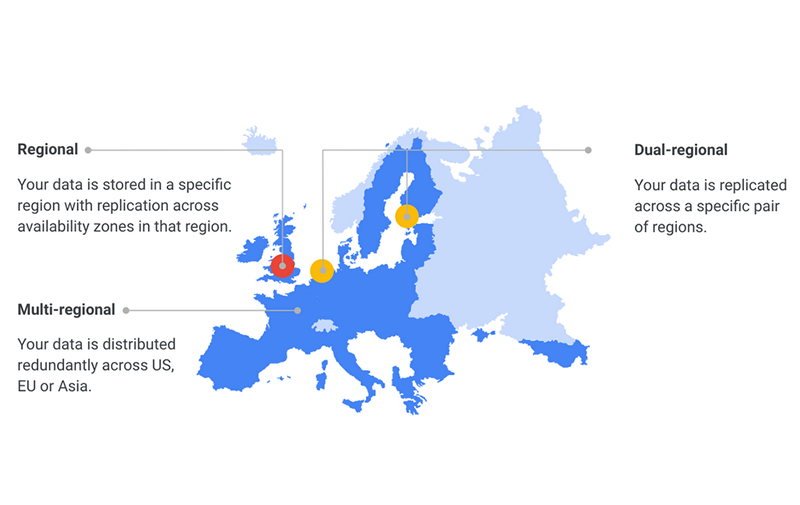 This allows customers to move large data sets across regions using Google infrastructure for ensuring availability and business continuity. A new dual-regional option for replicating data, which is especially beneficial for analytics or big data workloads. Customers are able to write to a single dual-regional bucket without having to manually copy data between primary and secondary locations. Nearline and Coldline data now geo-redundant in multi-regional locations, raising the availability of archival data stored this way. A new look coming for Cloud Storage choices. A new Cloud Storage C++ library so developers can customize their applications. 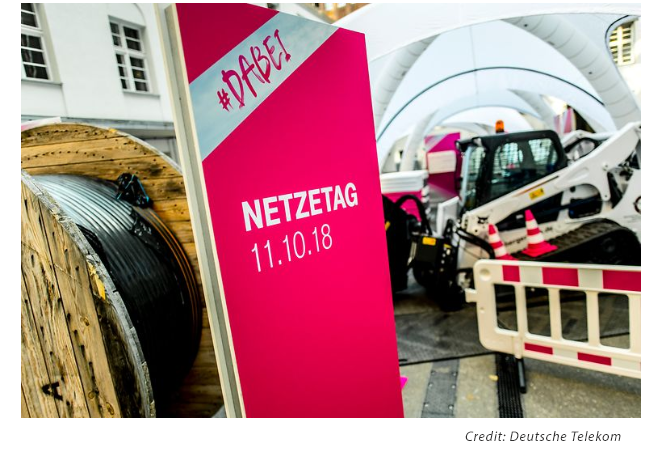 Deutsche Telekom CEO Tim Höttges outlined an eight-point program for rolling out 5G that targets coverage to 99% of Germany's population by 2025. The company is aiming to launch commercial 5G operation will launch in 2020 when terminal devices are available in sufficient numbers. Already 22,000 of the company's 27,000 mobile sites are already 5G-ready thanks to fiber-optic connectivity and the single RAN technology. 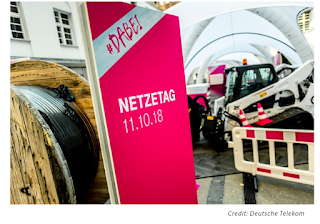 Speaking at the Telekom Netze-Tag event in Berlin, Höttges repeated his commitment to continue investing around 5.5 billion euros annually in the build-out of broadband networks in Germany. He called on representatives from the political and industrial worlds to cooperate with network providers to pave the way for "the best 5G infrastructure in the world." 5G coverage to 99 percent of the German population by 2025. Targetting 90 percent 5G area coverage by 2025. This level can be achieved with 4G in 2021. The DT Group will invest 20 billion euros in Germany by 2021. DT is also speeding up the installation of new antenna sites. It currently operates 27,000 antenna sites and will be adding at least 2,000 each year. The number of antenna sites will reach 36,000 by 2021. DT is currently running a 5G test cluster in central Berlin. Snowflake Computing, a start-up based in San Mateo, California, closed $450 million in additional growth funding led by Sequoia Capital and including existing investors: Altimeter Capital, Capital One Growth Ventures, ICONIQ Capital, Madrona Venture Group, Redpoint Ventures, Sutter Hill Ventures and Wing Ventures. New investor Meritech Capital also joined this round, which raises Snowflake’s pre-money valuation to $3.5 billion. Earlier this year, Snowflake announced $263 million new venture funding in a round led by ICONIQ Capital, Altimeter Capital and newcomer Sequoia Capital. This second round brings Snowflake’s total amount raised to $923 million. Snowflake is headed by Bob Muglia, who previously was president of Microsoft’s $16 billion Server and Tools Business, responsible for products such as Windows Server, SQL Server, System Center and Windows Azure. Snowflake recently announced its availability on Microsoft Azure and its continued support for Amazon Web Services (AWS). Snowflake has offered data warehousing services since 2015. It claims 1,000 active customers, including Netflix, Office Depot, DoorDash, Netgear, Ebates and Yamaha. EXFO reported sales in its fourth quarter of fiscal 2018 of US$69.2 million compared to US$63.0 million in the fourth quarter of 2017. Annual sales improved 10.8% to US$269.5 million in fiscal 2018 from US$243.3 million in 2017. IFRS net loss amounted to US$4.0 million, or US$0.07 per share, compared to net earnings of US$0.8 million, or US$0.02 per share, in the fourth quarter of 2017. In fiscal 2018, IFRS net loss totaled US$11.9 million, or US$0.22 per share, compared to net earnings of US$0.9 million, or US$0.02 per share, in 2017. Bookings totaled US$63.1 million for a book-to-bill ratio of 0.91 in the fourth quarter of fiscal 2018 compared to US$66.3 million in the fourth quarter of 2017. Overall for fiscal 2018, bookings increased 6.3% to US$267.7 million for a book-to-bill ratio of 0.99 from US$251.8 million in 2017. Gross margin before depreciation and amortization* attained 60.4% of sales in the fourth quarter of fiscal 2018 compared 61.9% in the fourth quarter of 2017. Gross margin before depreciation and amortization included restructuring charges of 0.7% of sales in the fourth quarter of 2018 and 0.2% in the fourth quarter of 2017. In fiscal 2018, gross margin before depreciation and amortization reached 61.0% of sales compared to 61.2% in 2017. Gross margin before depreciation and amortization included restructuring charges of 0.2% of sales in 2018 and 0.7% in 2017. "During fiscal 2018, we made significant progress to strategically transform EXFO into a supplier of software-intensive, end-to-end solutions and analytics for fiber, mobile and virtualized networks," said Philippe Morin, EXFO's Chief Executive Officer. 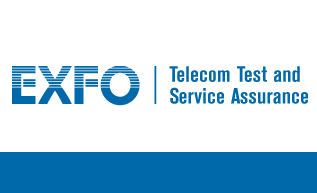 "While communications service providers are undergoing fundamental changes to their business models and network architectures with upcoming 5G and IoT deployments, EXFO has positioned itself as a supplier of choice delivering superior network performance, service reliability and subscriber insights through the acquisitions of Astellia and Ontology. Although these transformations are mostly unfolding according to plan, I am disappointed with our financial results in 2018 due to deal delays and the current market environment," Mr. Morin added. "Nonetheless, we have planned significant improvements for 2019 with an increased focus on execution."